He joined the community back in 2004 and has written more than 6,000 posts since then. That’s an average of about 2 posts daily! He’s none other than Brad Olson, aka “ScreamingChicken,” one of our dedicated board moderators, so I thought it was about time we grilled him with a few questions to get to know him better. Q: What’s your favorite Steven Raichlen book? Recipe? Or grilling tip? ScreamingChicken: The favorite book is a tough one, because they range from introductory (How To Grill) to barbecue and grilling in the US (BBQ USA) to worldwide (The Barbecue! Bible, Planet Barbecue). The one I reach for first, though, is usually BBQ USA. My two favorite recipes are probably Garlic Pepper Rib Roast and Baltimore Pit Beef, both from BBQ USA. The tip I like best isn’t really related to a specific ingredient, recipe, or technique: “It’s not rocket science.” It’s a good reminder that there’s a level of forgiveness in barbecue and that it’s not necessary to obsess over the minutiae. Q: Why did you join the BBQ Board back in 2004? ScreamingChicken: I was moving beyond simple direct grilling then and wanted to know what others were doing. Q: How often do you grill per week? ScreamingChicken: Weather permitting, three days or more. And on weekends that can include more than one session per day and/or an overnight cook. However, it’s not uncommon for me to take a week to 10 days off a couple of times a year, just to recharge. Q: What grilled dish do you make most often? ScreamingChicken: That’s a tough one. I buy beef in bulk so I have a lot of different steaks on hand, and whenever pork chops or pork steaks are on sale I stock up. I think I’d have to say that pork steak is likely to be the cut I cook most often. Q: What grill(s) do you use? What do you like about it? ScreamingChicken: Weber kettles from the Smokey Joe all the way up to the 26-3/4″ model (although I do use a Go-Anywhere for tailgating). When I was young my dad had a kettle grill before he switched to gas so it’s what I learned on, and growing up less than 2 hours from Weber’s home in Arlington Heights, IL, meant a lot of exposure to Weber products. And when my wife and I moved into our house in 1990 her brother gave us a 22″ Bar-B-Kettle, so the die was pretty much cast at that point. My Webers have always been well built and a good value for the money (especially when bought used), and Weber customer service is outstanding. Q: What’s your grilling style? ScreamingChicken: Because my grills aren’t close to the house I try to pick side dishes that can either cook relatively unattended or quickly while the meat’s resting so that I don’t have to run between the house and the garage too much, or side dishes that can be done at the same time. Overall, I have a pretty simple approach and don’t go for gadgets; the most complicated piece of equipment I use is a $10 probe thermometer dropped through the lid vent to keep track of the temperature. I also probably experiment recipe-wise less than others and tend to stick to minor variations of tried-and-true things. Q: What do you love about grilling? ScreamingChicken: The way it makes the food taste, of course, and that it gets me out of the kitchen. It was also the first style of cooking I really got into, so it has a certain nostalgic value as well. 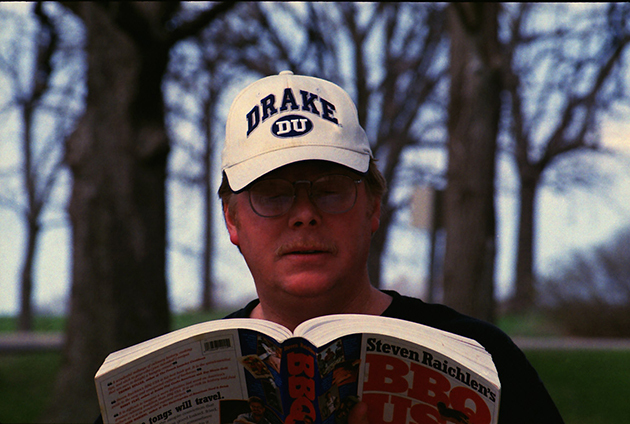 I took a class called “Bachelor Cooking” in 8th grade, and my favorite day was when we went to a local park and grilled. Q: What’s your favorite grilling tool or product and why? ScreamingChicken: That’s a tough one, because some are more specialized than others. A good pair of tongs is used far more often than a press or weight, but when the latter’s needed, nothing’s more important. But I do love using my rotisserie, so let’s go with that. There’s just something about watching the spit turn. Q: What was your best or proudest grilling moment? ScreamingChicken: I can’t really think of a single instance, but whenever someone asks for seconds, I know I’ve done a good job. And since I’m not a competitive barbecuer, that’s my goal every time. Q: What’s your favorite grilling story? ScreamingChicken: We were in Hawaii in 2004 for my wife’s cousin’s wedding and we stayed at a condo with my in-laws. There were gas grills there, so one night I grilled some pork chops and when they were done I turned the burners to “high” to clean off the grates, but didn’t remember to turn them off until we were well into dinner. By that time the grill was a roaring inferno, but fortunately nothing bad happened, and the guy who used it next had some very clean, very hot grates to work with! Q: What are the harshest or most extreme conditions you’ve ever grilled in? ScreamingChicken: Since I grill in a covered structure the winter weather here in Wisconsin isn’t usually a factor, but in the summer it can get pretty hot, and there have been a number of occasions (especially last summer) when the temperature inside has gotten up past 105 degrees … and it’s NOT a dry heat! That must be what grillers in the southeast deal with on a regular basis. Q: What grilling tips, advice, or wisdom would you like to share? ScreamingChicken: Never be afraid to experiment or ask questions. It’s a learning process that never ends and mistakes are never the end of the world.